How Do I Know What Size My Septic Tank Is? Septic tanks come in all shapes and sizes, and it’s easy to forget — or never learn — the size of the septic tank on your property. Because its size affects how often it should be pumped, however, it’s important to know the size of your septic tank. There’s two ways to do this (but only one way to know for certain). This could be paperwork left by the original system installer, the last provider who pumped the tank, or the previous owner. You can also contact your county’s septic permit offices and request the records on your septic system. These documents can include the location, size, and layout of your septic tank, but are not always accurate. You can also take a look inside your home for clues. The size of the septic tank you need depends on the number of bedrooms in the home and the home’s square footage. Here’s a table you can use to get some idea of what size your septic tank may be. Although paperwork and the size of your home can give you an idea of what size septic tank you may have on your property, it may be no more than a guess. Documents can be wrong, and a previous owner may have installed a larger or smaller tank than necessary. The only way to know for certain the size of your septic tank is to hire a septic maintenance provider to locate, open, and pump the tank. At that time he or she will be able to tell you its exact size and if it’s in good shape or needs maintenance. 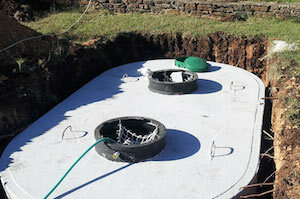 Why does it matter if you know the size of your septic tank? Because that affects how often it needs to be pumped to keep operating at its peak. Generally we recommend pumping your septic tank every 3-5 years — the smaller the tank, the more often it must be pumped. Tanks that go too long without this maintenance are likely to become backed up or fail, requiring expensive repairs or replacement. Whether you need help locating, sizing, or pumping your septic tank, Van Delden Wastewater Systems can help. We installed our first septic system in 1937, and specialize in all types of septic systems and Clearstream aerobic systems. Contact us today for all your septic system needs. Hello we live in garden ridge Texas and have a norweco septic system. We are looking for someone who will do the quarterly inspection. Please let me know if you service this type of system and the yearly cost. Thank you. Hi, thank you for inquiring about our aerobic system services. Although we do service Garden Ridge, we only service Clearstream aerobic systems, so unfortunatley, we won’t be able to assist you with your Norweco system. Best wishes.